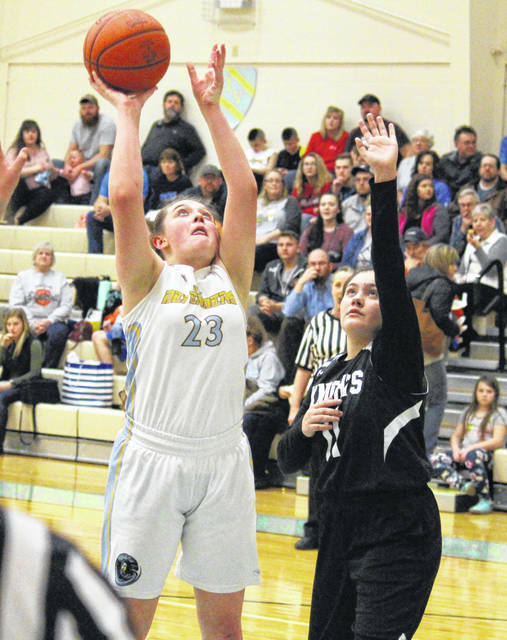 OVCS senior Kristen Durst (23) shoots a two-pointer over Parkersburg Christian’s Courtney Cline (11), during the Lady Defenders’ 22-12 victory on Monday in Gallipolis, Ohio. GALLIPOLIS, Ohio — Twenty games in, and the record is back to even. 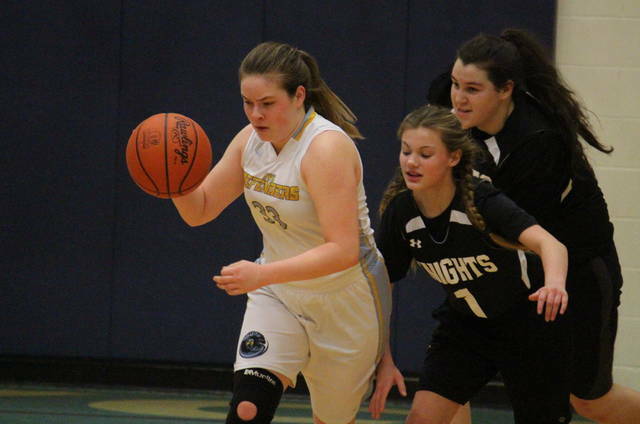 The Ohio Valley Christian girls basketball team picked up its 10th win of the season on Monday night inside its home gymnasium, defeating guest Parkersburg Christian 22-12 for the season sweep of the Lady Knights. OVCS (10-10) — which also bested PCS on Jan. 14 in Wood County by a 41-17 tally — led 6-3 minutes into Monday’s contest. The Lady Defender lead was at double digits within the first six minutes of the second quarter, and the hosts settled for a 15-7 halftime advantage. Ohio Valley Christian pitched a shut out in the third quarter and headed into the finale with a 20-to-7 lead. The hosts led by as many as 14 points in the fourth quarter and cruised to the 22-12 win. Following the victory, OVCS head coach Chris Burnett talked about winning for his senior trio of Emily Childers, Joicy Liao and Kristen Durst. The hosts connected on 9-of-64 (14.1 percent) field goal attempts, including 2-of-9 (22.2 percent) three-point tries. OVCS was 2-of-10 (20 percent) at the foul line, where PCS was 2-of-5 (40 percent). 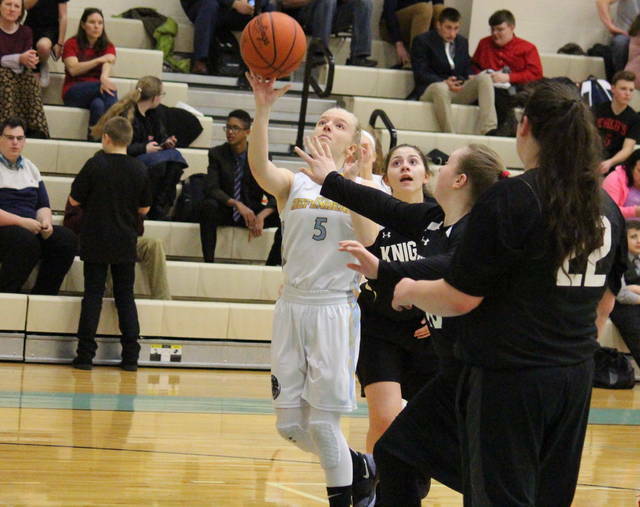 The Lady Defenders collected 25 rebounds and committed 15 turnovers, while earning 28 steals and two assists. Childers led the victors with seven points, to go with a game-best 12 steals. 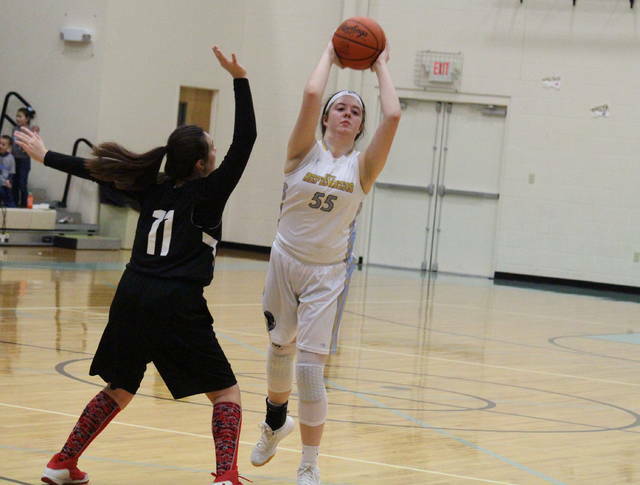 Leticia Araujo recorded six points and six rebounds for the hosts, Lalla Hurlow added four points, while Durst scored three and Chloe Payne tallied two. Childers and Lauren Ragan each came up with an assist in the win. Willow Walker led the guests with seven points, followed by LouMasi Lott with four and Jayla Gard with one. Next, the Lady Defenders will visit Cristo Rey for the tournament opener on Saturday in Columbus.